//After our excellent work on the Broforce trailer, Devolver Digital gave us the chance to work on the video game trailer for another one of their innovative indie games. 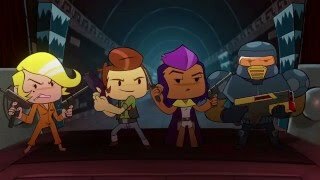 This time, we created a spunky action video for the game Enter the Gungeon, a dungeon crawler meets first person shooter. With these cartoony designs, we got to show off a striking combo of our traditional and flashed based animation skills. 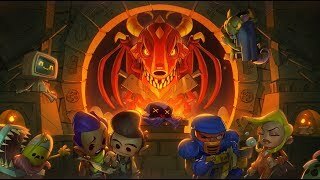 Our Powerhouse team worked closely with the original Gungeon illustrations and sprites and adapted them into designs suited for 2D animation. Our team referenced the original pixel art backgrounds from the game itself to create the scenery for the trailer, which follows the Gungeon characters through various levels from the game. We combined animation techniques, both Flash-based puppet animation and traditional frame-by-frame animation, to crank the volume up to 11. The next time you want cute & violent all in one awesome package, you know who to call.